Down East Books, 9780892727841, 205pp. This inspirational tale of friendship and determination also sheds new light on the role of the mentor's mentor. Discover why this friendship was so crucial to Roosevelt's development as a man and a president-and why it still matters today. Andrew Vietze, the former managing editor of Down East: The Magazine of Maine, has written for a wide variety of magazines and online publications, including Time Out New York, The New York Times' LifeWire, Weather.com's Forecast Earth, Crawdaddy!, AMC Outdoors, Popmatters, Hooked on the Outdoors, Explore, Offshore, Big Sky Journal, MaineBiz, and Maine Times. Two of his pieces for Down East have won awards for feature writing from the International Regional Magazine Association. 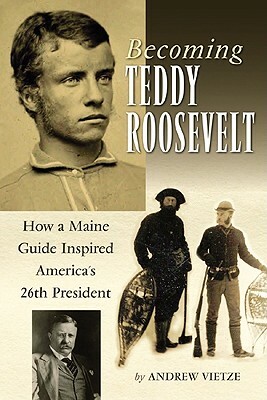 Becoming Teddy Roosevelt: How a Maine Guide Inspired America's 26th President won a silver medal at the Independent Publisher Book Awards, was honored by the Maine State Legislature, and was a 2010 Book of the Year Award finalist in the biography category. It also spent weeks on the Maine Sunday Telegram's bestseller list and inspired the Lunder New Naturalists program at Coastal Maine Botanical Gardens, which uses the story of Theodore Roosevelt as an entry point for middle schoolers into the world of conservation. More than 19 schools and 600 students, are now part of the statewide program. Vieteze spends six months of each year as a ranger in the wilds of the Katahdin region.